hb1 MIDI Breath Station, Other MIDI Controller from Hornberg Research. Hornberg Research, a young german company, debuts with a new high-end MIDI breath controller, called hb1 MIDI Breath Station. 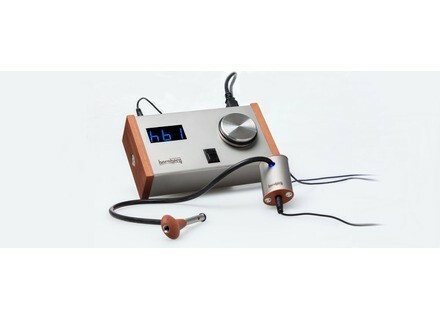 The hb1 MIDI Breath Station combines a wooden and stainless steel mouthpiece and silicone hose, a precision pressure sensor also made of wood and steel, with a necklace, and a control box that features a MIDI interface and a screen on which you can see the MIDI breath value in real time. A MIDI Merge function is also available. 9 parameters are available, for which you can save up to 25 presets each: release, dynamic attack, drive, offset, realtime data reduction, realtime signal reverse and limit, MIDI channel and continuous controller. The control box includes USB and standard MIDI ports (1 in and 2 outs) and can operate in standalone or with a computer. The unit is USB powered (supply included). The hb1 MIDI Breath Station is available for 890€. You’ll find all the details at hb1 MIDI Breath Station. The McDSP Channel G Surround in AAX format McDSP has released AAX Native and DSP versions for its Channel G Surround EQ and dynamics processor. Yamaha updates Nuage to v1.5 Yamaha announced at the NAB Show 2014 the release in May of version 1.5 of its Nuage audio production system software. The SoundToys plug-ins in AAX and 64-bit formats Pro Tools 11 users can finally use the SoundToys plug-ins on their platform, thanks to the release of the new AAX version.